Program to celebrate friendships formed in downtown neighborhood. he Japanese Hospital of Los Angeles, located in Boyle Heights on First and Fickett streets. 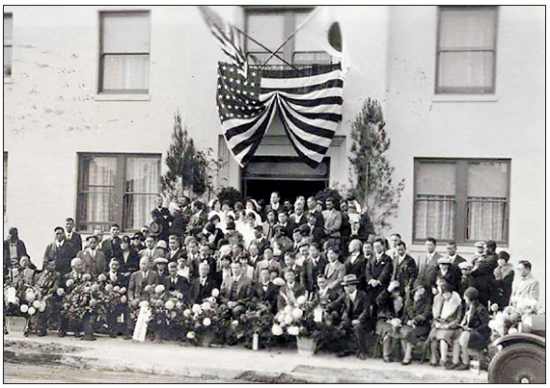 The Boyle Heights Historical Society and Little Tokyo Historical Society will be co-presenting Boyle Heights History Day on Saturday, Nov. 8, from 10 a.m. to 4 p.m. at the historic Breed Street Shul, 247 N. Breed St., Los Angeles. The program includes music by Boyle Heights’ The Neighborhood Music School, Rubén Guevara reading his “Yuriko & Carlos” short story, a screening of “Stand Up for Justice: The Ralph Lazo Story” by writer and director John Esaki, vintage photo displays, and light refreshments. The day will spotlight the close connections and friendships between the long-ago Japanese American residents of Boyle Heights and the larger Boyle Heights neighborhood. BHHS will feature family members’ fond remembrances of Molly Wilson Murphy, an African American lady who held many friendships with Japanese Americans before World War II and and wrote many letters to the internees during the concentration camp years. Sadly, she passed away during the summer due to natural causes. Her letters are housed at the Japanese American National Museum. LTHS will have a panel discussion on the former Japanese Hospital, the nondescript building that was at 101 S. Fickett St. and East First Street, which has a rich but unknown history in the neighborhood. The story of the hospital is important to Boyle Heights, Los Angeles, California and U.S. history. LTHS is now working on a City of Los Angeles Historic-Cultural Monument application for the Japanese Hospital. The panel will include Carole Fujita, Troy Kaji, M.D. and Kristen Hayashi. Kaji is the grandson of a seminal figure, Dr. Kikuwo Tashiro, a Little Tokyo doctor who was the lead physician in a successful U.S. Supreme Court case in 1928 that allowed the hospital to be built in 1929. Street parking can be found around the neighborhood. Convenient city public parking lots are on North Chicago Street south of Cesar Chavez Avenue and North Breed Street north of Cesar Chavez. For more information, contact LTHS President Michael Okamura at (626) 840-8409.